If you ask three economists the same question, you’re likely to get (at least) three different answers. While soybean acres seem to have an advantage going into the Spring, particularly in Indiana and the Eastern Corn Belt, we thought it would be valuable to evaluate university crop budgets from across the Corn Belt. This week’s post takes a look at recent crop budgets and why additional soybean acres in 2017 might not be a clear winner for producers in all regions of the country. When comparing crop budgets from Iowa State, the University of Illinois, and Purdue, each is compiled slight differently and have a different measure, or metric, used to compare corn and soybeans returns. While each of these measures have different meaning, the intent of this post is to focus on the economic advantage corn or soybeans have from each budget. To make the budgets comparisons more meaningful, the commodity price assumptions from the Illinois budgets were used across all three budgets to eliminate variations due to price assumptions. Further, it is important to point out that we are not arguing for one budget over the other, rather the idea is to get a better understanding for some of the issues that are likely to be driving planting decisions this Spring. Iowa State’s corn and soybean budgets (figure 1) provide a total return estimate which accounts for fixed expenses – including land and equipment – and variable expenses. For 2017, corn returns of $-1 per acre were budgeted. This slight loss was better than soybeans’ budgeted return of $-28 per acre. This is a slight change from 2016, when soybeans had a slight edge with budgeted returns of $-3 per acre compared to $-26 for corn. Figure 1. 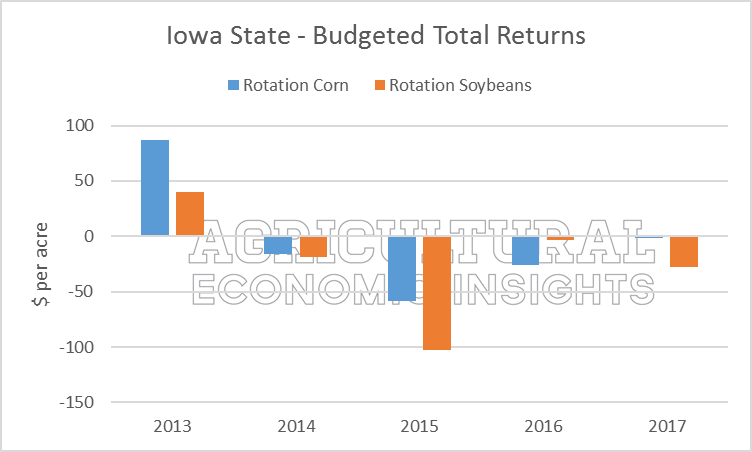 Budgeted Total Return of Rotation Corn and Rotation Soybeans, Iowa State Budgets. (University of Illinois Price Assumption Used). The University of Illinois crop budgets (figure 2) provide a return to farmland and the operator – which are the earnings used to cover land costs and family living/management. The 2017 budgets favor soybeans by $47 per acre ($235 for soybeans compared to $188 for corn). The soybean edge is greater than last years’ of $42 per acre. While Illinois and Iowa budgets send a different signal for 2017, they were consistent in the previous years. In 2013 and 2015, both budgets favored corn by a large margin. For 2014, the advantage was narrow, but favored corn. In 2016, both favored soybeans. Figure 2. 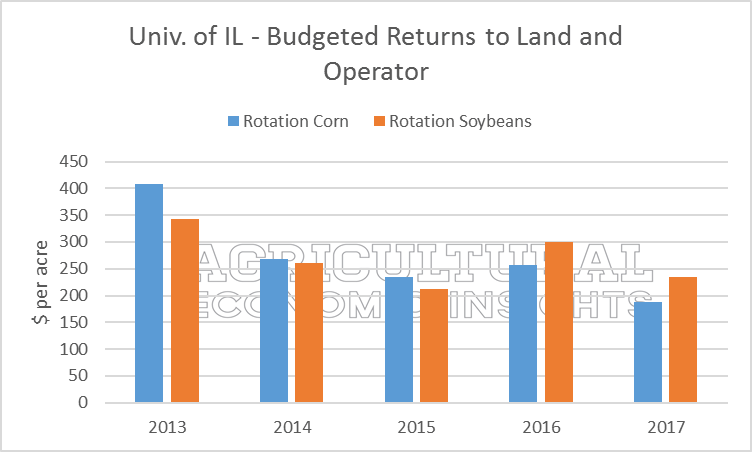 Budgeted Total Return of Rotation Corn and Rotation Soybeans, University of Illinois Budgets (Central Illinois, High Productivity Land). The Purdue crop budgets use contribution margin to compare corn and soybeans returns (figure 3). The contribution margin are the earnings that remain after variable expenses –seed, fertilizer, crop protection, etc. – are paid and what is available to cover fixed expenses – land, machinery expense, family living, etc. Using the Purdue expense and yield assumptions – along with the Illinois price assumptions – the crop budgets favor soybeans in 2017 by $47 per acre (a soybean contribution margin of $348 per acre compared to $301 for corn). Furthermore, using the Illinois price assumptions, soybeans held an edge in every year except 2013. Soybeans also had a strong Purdue budget advantage in 2014 as well. That year’s soybean advantage came as Illinois and Iowa budgets gave a small advantage to corn. Figure 3. 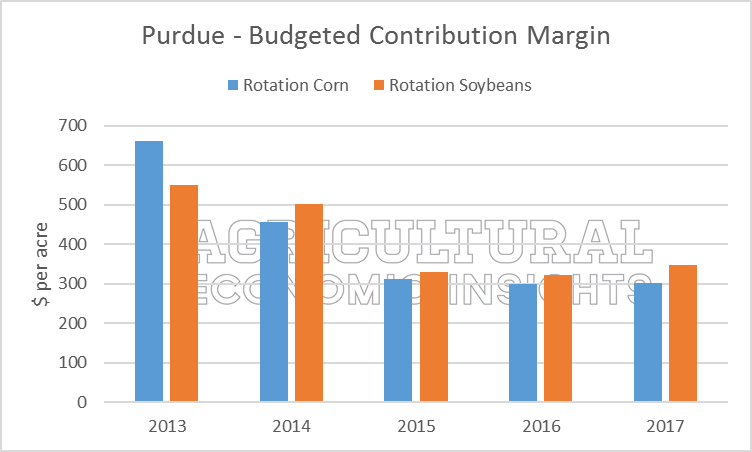 Budgeted Total Return of Rotation Corn and Rotation Soybeans, Purdue University Budgets. (University of Illinois Price Assumption Used). At this point, you’re probably at the same conclusion we reached: “What is going on?” It is understandable that the magnitudes across the budgets would vary – given we are looking at different “bottom-line” measures- but in some years the budgets seem to be saying different things. For instance, in 2014 the Purdue budgets favored soybeans while Iowa and Illinois gave a small edge to corn and in 2017 Purdue and Illinois have large advantage towards soybeans while Iowa gives an edge to corn. Digging into each budget’s expenses, we found a lot of interesting differences. For example, the Purdue budgets assumed 200 pounds of nitrogen used (at a 204-bushel yields on high productive land) while Iowa State assumed 131 pounds of nitrogen for 180-bushel corn. These different assumptions are part of the story. But most of the variation across the budgets appears to be driven by how costs have been adjusted lower in recent years. 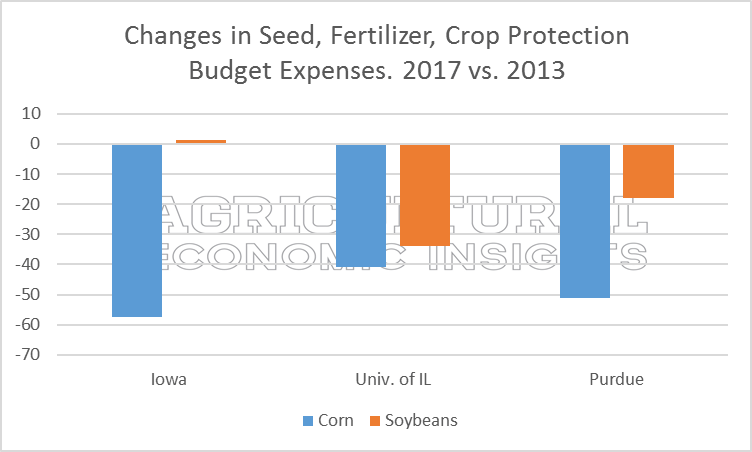 In figure 4, changes in the budgeted expenses of seed, fertilizer, and crop protection for corn and soybeans are shown for the three budgets. The graph shows the difference between these expenses in 2017 and 2013. During this time period the Iowa State budgets adjusted corn expenses down the most, lowering them $57 per acre. Meanwhile, Illinois ($-41) and Purdue ($-51) budgets also adjusted these costs lower, but not as aggressively. Figure 4. Change in Seed, Fertilizer, and Crop Protection Budget Expenses. 2017 compared to 2013. Differences were more obvious with soybeans. 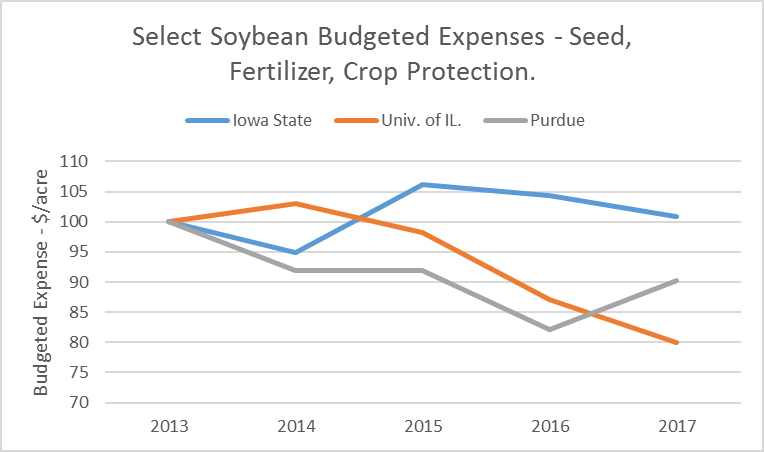 Illinois budgets adjusted soybean expenses the most ($-34 per acre) over the 5 years while Iowa State budgets slightly increased soybean production expenses. Annual changes in seed, fertilizer, and crop protection expenses for corn and soybeans can be found here and here. In Table 1, a break-down of the changes in seed, fertilizer, and crop protection expenses can be found. 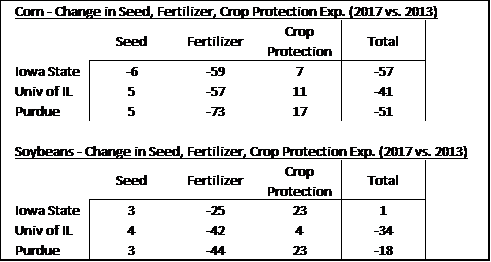 While fertilizer expenses have changed in all budgets – as one would expect given declining fertilizer prices –changes in seed and crop protection have also been impactful. Iowa State budgets have corn seed expense lower over the 5 years, yet corn seed expenses were budgeted higher in the other budgets. Also, crop protection increased in all the budgets, but at different magnitudes. For instance, crop protection expense changes increased as little as $4 per acre (soybeans in the Illinois budgets) and as much as $23 per acre higher (soybean budgets in Iowa and Purdue). Table 1. Breakdown of Changes in Seed, Fertilizer, and Crop Protection Budget Expenses. 2016 compared to 2013. While many signals point to soybeans having an economic advantage in 2017, not all university crop budgets favor soybeans. The Purdue and University of Illinois budget favor soybeans in 2017, as they did in 2016, but the Iowa State budgets favors corn. Differences are not uncommon and happened in 2014 when the Purdue budgets strongly favored soybeans while Iowa State and the University of Illinois favored corn. Given tight margins, cost reduction is an important part of production agriculture. When evaluating seed, fertilizer, and crop protection expenses across the three university budgets, the adjustments were not consistent. Inconsistencies in production costs adjustments are also likely common across farms too. 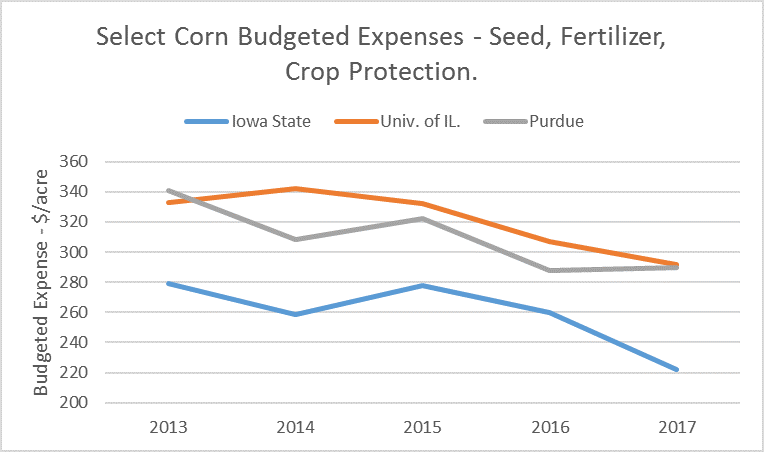 If a farm has 1) worked corn seed expenses lower 2) had small increases in corn crop protection expense and 3) had large increases in soybean crop protection expense, their budgets in 2017 might favor corn – similar to the Iowa State budgets. On the other hand, if a farm has budget conditions similar to the University of Illinois – which was been the least aggressive on corn expense reduction but the most aggressive with soybean expense reductions- their operation is likely favoring soybeans. It’s important producers carefully consider their farm’s unique production expenses headed into 2017. While additional acres of soybean across the U.S. in 2017 are expected, farmers – especially if facing herbicide resistance issues – might find themselves with a different budget signal than the national trends. How widespread these differences are will likely play a key role in determining how planted acres adjust in 2017. Most of the current signals still look to favor soybeans and it is likely soybeans will gain ground on corn acreage in 2017, but each farmer will have to look at their own budgets to make the call. These estimates are different from the earlier AEI post and the posted Purdue budgets as we have used the Illinois assumed prices to make the budget more comparable. This is especially surprising sense we used the same price assumption across each budget for the given year. More specifically, we used the University of Illinois prices estimates for each year in the three budgets to remove variation due to commodity price estimates.